The title of Toshio Masuda’s 1967 film Like a Shooting Star aptly describes its main character, Goro (Tetsuya Watari), a cooler-than-thou gangster, who burns brightly and is gone just as fast. “If I don’t kill you, someone else will,” Goro is told at one point. At the film’s outset, he is sent to maim a rival gang boss and ends up killing the man. He is hidden away by his yakuza family in the port city of Kobe, and told he will be sent for in six months, which stretches to a year. He is bored with the slow pace of Kobe, and listlessly hangs around, occasionally beating up unruly drunken U.S. soldiers on leave from Vietnam at the bar he runs. Goro passively endures a casual romance with his girlfriend Yukari, who constantly begs him to tell her he loves her. He mouths the words, but with little feeling. Soon enough, however, he gets the excitement he craves. Unbeknownst to Goro, someone is shadowing him. Also, a jewelry trader, Kojima, arrives in town, and soon after disappears. Meanwhile, Usu, a Tokyo detective who has been on Goro’s tail for a long time, waiting for him to slip up so he can throw handcuffs on him, pops up every now and again to taunt him. After Kojima’s disappearance, his fiancé Keiko (Ruriko Asaoka) shows up, and Goro is instantly smitten. He takes her around, knowing full well Kojima has been killed, but pretending to ask around to learn his whereabouts. He bluntly voices to Keiko his desire to sleep with her, and Keiko resists. Nevertheless, they are drawn to each other, and Goro begins to reveal a deeper side that he has heretofore resolutely kept hidden, beneath the veneer of the whistling, icy, detached yakuza. However, he fails to see that his destined end is about to reach him. Like a Shooting Star is very much a rewrite of Godard’s Breathless, even down to the betrayal at the film’s conclusion. It was a remake of director Toshio Masuda’s 1958 film Red Quay, which itself was inspired by another classic French gangster film, Pépé le Moko. In this film, Keiko extols the virtues of Paris to Goro, who strenuously refutes her romantic notions. Masuda relies less on action scenes than the snappy repartee of its leads, as both the haughty rich girl and the self-consciously cool gangster trade barbs that at first disguise the passion they begin to feel for each other. The film boasts highly stylized cinematography by Kuratoro Takamura, and the production design is just as striking, courtesy of Takeo Kimura, who also designed the distinctive sets of Seijun Suzuki’s films. 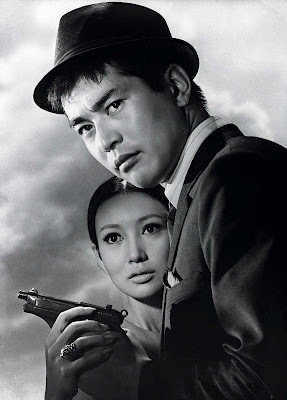 Lead actor Watari also starred in one of Suzuki’s most famous films, Tokyo Drifter (1966). Like a Shooting Star also features a notable appearance by Jo Shishido, one of Nikkatsu’s biggest stars, as the hitman pursuing Goro.